Your loved one’s death will surely come as a shock but it will surely not be something unexpected—after all, everyone’s death is inevitable. However, despite the grief, you still have the responsibility of having a proper funeral that will lay the deceased to eternal rest. One of the first things that you should do is announcing the death of the person so that his or her other family members and friends can be part of the ceremony. And what better way to send out your invitation than using a banner, specifically a funeral banner? Designing funeral banners from scratch might get challenging. Luckily for you, there are pre-made banner templates that you can conveniently use that will make you save so much time enough to do other funeral-related preparations. 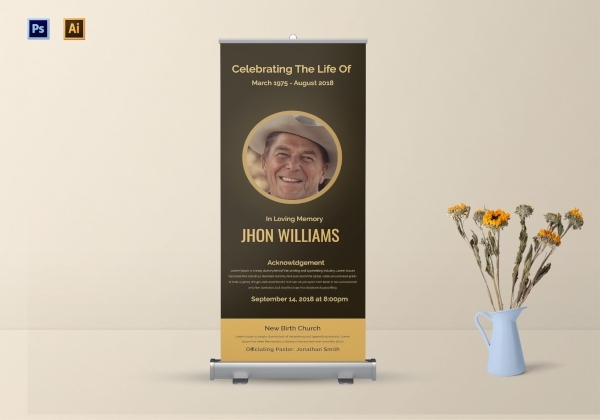 And with that, we give you various funeral banner examples and templates that can help you get your own funeral banner design done in no time. 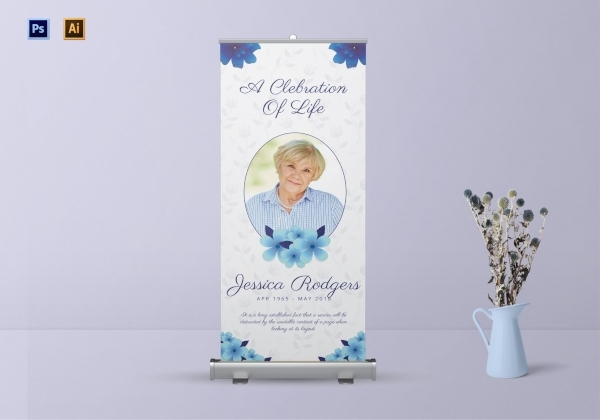 Here is an elegant funeral roll-up banner that is just perfect if your loved one had indeed lived life with utmost elegance. With its customizable layout that you can edit using Adobe Illustrator and Adobe Photoshop, you can simply just add in the image of your deceased loved one and all the necessary details regarding his or her funeral rites. 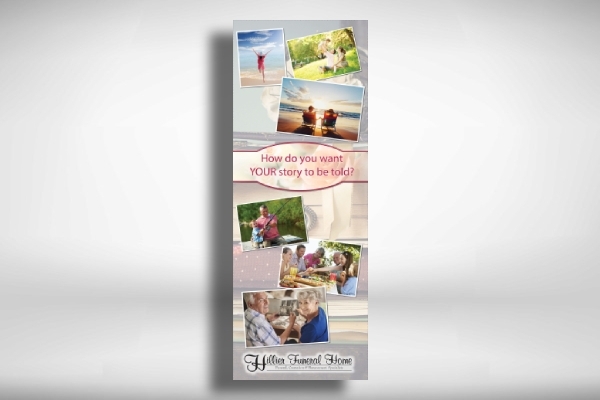 If you are looking for a banner that can both function as an announcement and as an invitation to your loved one’s family members and friends, then we may have already found you an excellent template for that. 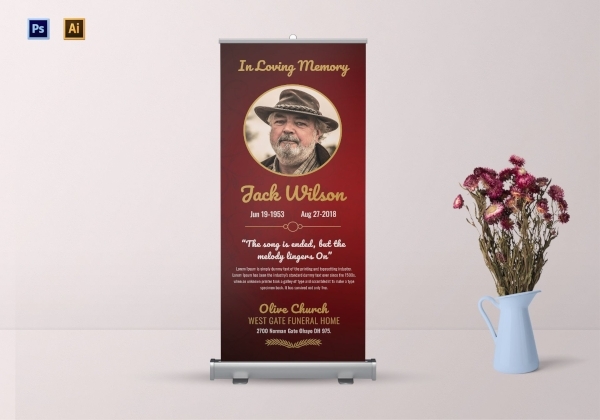 This funeral announcement roll-up banner can function any of the two since it contains the elements that make up one. 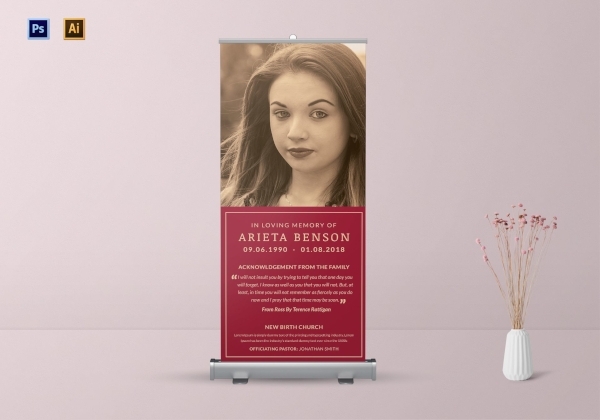 Invite family members and friends to attend one of your deceased loved one’s funeral service with the use of this bright red funeral invitation roll-up banner. 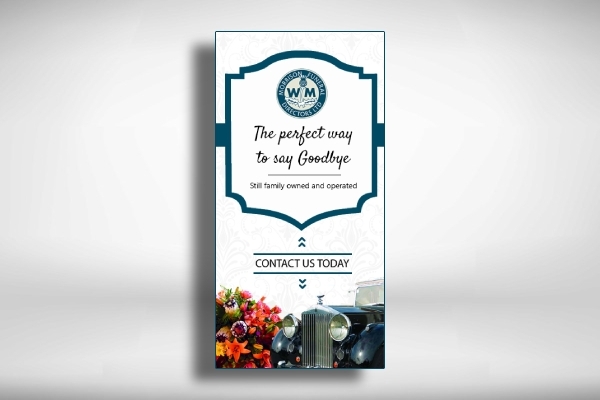 With the use of this banner, you can easily incorporate all the necessary details regarding your loved one’s funeral such as the name of the funeral home where the wake is being held. If your beloved family member dies, you will obviously need to make all the necessary arrangements for his or her interment so that the people that made his or her life special and meaningful can bid a proper farewell. And in order for them to effectively and actually receive the message, the use of a template, such as this loving memory funeral roll-up banner, is highly encouraged. No matter how sad it is, you have to accept that your loved ones will really come and go. Despite the grieving, you still need to do all the necessary arrangements that will properly send them off to eternal rest. One of the necessary things that you should do is to make sure that the rest of the family already knows with the use of a banner. 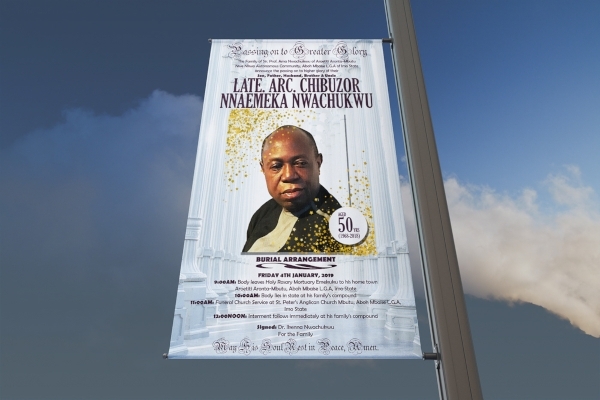 The good thing is, we have already provided you this premium funeral roll-up banner that can help you fulfill your responsibility without affecting your grieving. Do you run a funeral home? You can always make use of a banner as your marketing effort in your social media accounts or even in your official website that will encourage your target customers to avail of your funeral services. You may add a catchy headline that will attract your target customers as well as a call of action that will lead them to actually click it, visit your site, read your services, and finally contact you to avail one. Christmas may be a joyous time where one cannot think of something really devastating such as someone’s death. However, as mentioned, everyone’s death is inevitable. As morbid as this may sound, death can also happen anywhere and anytime even at the most wonderful time of the year. 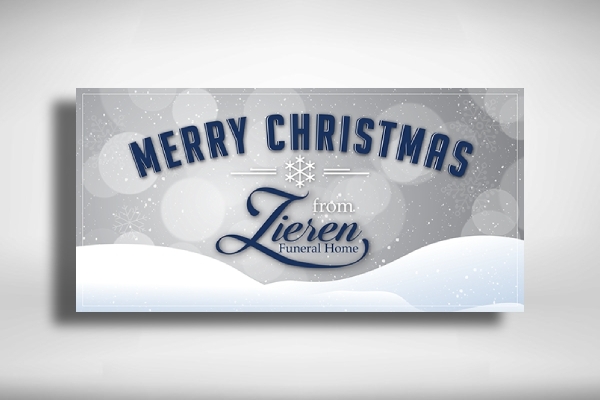 This is why if you run a business that provides interment and funeral service, you can still promote your business through the use of a banner such as this funeral home Christmas banner. Interment and funeral services do not have to be gloomy like the usual interment and funeral services that you may have already witnessed before in other funerals. If you run a business that offers such services, you may deviate the sadness by providing a way that will allow people to celebrate in good light the life that once lived by the deceased. 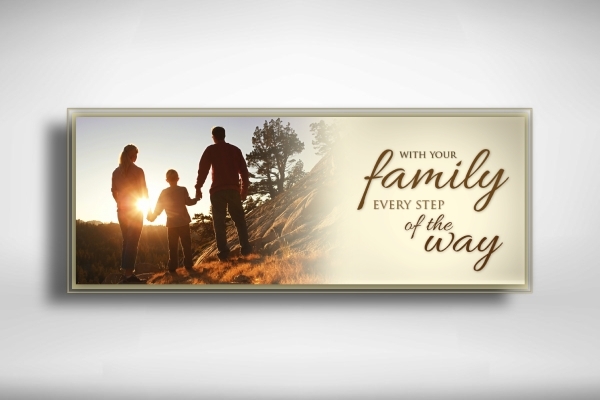 Are you doubtful of adding details on your funeral banner? Don’t be! 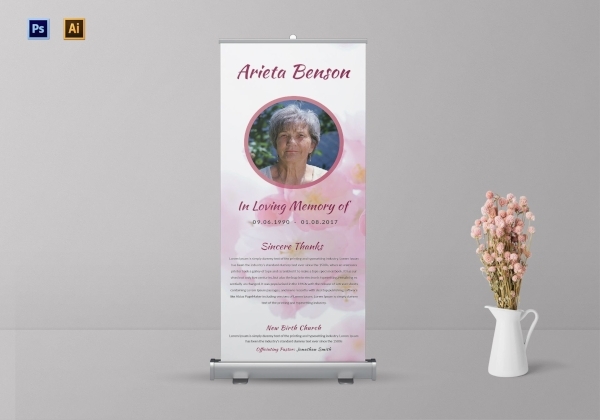 You surely can incorporate more details than usual on your funeral banner especially if you want to provide complete information about your loved one’s funeral program. Similar to the given example above, you can also include a detailed schedule of how the funeral will go. Having this kind of funeral banner will be effective especially if your deceased loved one is also a prominent individual and that many people, apart from his or her immediate family and close friends, would like to know more about the details of the funeral. Do you run a website for the business where you provide services that help people part and bid farewell to the diseased with no heavy heart? You may make use of a web banner similar to this example above. This web banner can be a part of your marketing efforts that can be useful when advertising your services to your target customers. We hope that this article provided you with enough funeral banner examples and templates that you can conveniently use in announcing your loved one’s departure. Do take note that these templates can be edited using various editing applications so you will be able to create your own design in no time.